Uhuru Kenyatta, the son of Kenya’s founding president, won the presidential election with a slim margin of 50.03 percent of votes cast, provisional figures showed, just enough to avoid a run-off. Seven loud explosions shook Nigeria’s northeastern city of Maiduguri on Friday, witnesses said, hours after President Goodluck Jonathan ended a trip there to try to galvanize support for his battle against Islamist insurgents. French forces have seized a significant arms cache in northern Mali believed to have belonged to Islamist jihadist groups, including “tons” of heavy weapons, suicide belts and equipment for improvised explosive devices, France’s defense minister said Friday. Last week, Nigerian security forces in Kano and Maiduguri killed at least four suspected high-ranking members of the Boko Haram sect and arrested two others. That tally includes the group’s infamous spokesman Abu Qaqa, who has been reported dead before. This week, security forces have mounted crackdowns on Boko Haram in Yobe and Adamawa States. While clashes between security forces and sect members are frequent, these crackdowns have been significant for their scale. “The Joint Task Force has succeeded in killing 35 Boko Haram terrorists in shootouts between Sunday evening through Monday,” said Lieutenant Lazarus Eli, a military spokesman in Yobe state, of which Damaturu is the capital. A round-the-clock curfew was imposed in the city late Saturday, ahead of the operation that also led to the arrest of 60 suspected Boko Haram members. The curfew has been relaxed and residents are now allowed out of their homes from 7:00 am to 10:00 pm (0600 GMT to 2100), Eli said. The ban on movements in Yobe’s economic capital of Potiskum has also been eased. Military forces went door-to-door through three Damaturu neighbourhoods beginning late Sunday and engaged militants in “a fierce exchange of gunfire” through to the early hours of Monday morning, the spokesman added in a statement. Two soldiers were injured in the fighting. A list of weapons that Eli said were recovered from Boko Haram hideouts included dozens of guns, explosive devices and hundreds of rounds of ammunition as well 32 arrows and two swords, among other items. “In the three-day operation, the town was placed under 24-hour curfew, which enabled soldiers to comb the nooks and corners,” said Lieutenant Saleh Mohammed Buba, military spokesman in Adamawa. “A total of 156 suspects were rounded up in raids of suspected (Boko Haram) hideouts. A sect commander known as Abubakar Yola who went by the alias Abu Jihad was shot dead in a shootout while trying to flee,” he added. The detained suspected gunmen would soon be produced in court, Buba said. The spokesman said about 300 explosive devices were discovered in what he described as an armory used by the sect, where about two dozen AK-47 guns were also being stored. These crackdowns follow Boko Haram’s attacks on cell phone towers earlier this month. 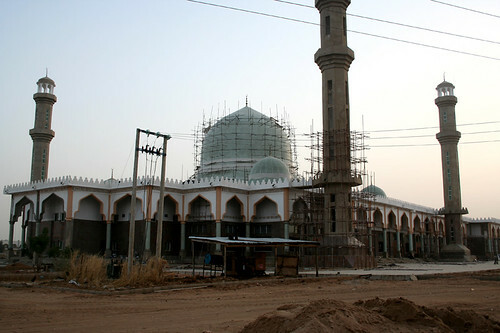 A suicide bombing at a church in Bauchi State on Sunday is believed to be the group’s work. The crackdowns, along with the arrests and shootings of sect commanders, certainly put pressure on Boko Haram. Their success in disrupting the group’s activities will have to be judged over time, though. For one thing, militant groups and terrorist movements are often able to replace slain commanders with relative ease – the headline “Al Qaeda No. 3 Killed” has been written so many times that it has become a joke in some quarters. Second, the massive crackdown on Boko Haram in 2009 did succeed in driving Boko Haram underground for months, but it also seems to have fueled the group’s grievances against the state, especially security forces. Force will undoubtedly be part of the state’s response to Boko Haram. What matters is how force gets used. To the extent that security forces can target known sect members while avoiding harming and harassing civilians, and can pair forceful tactics with sophisticated strategies for answering the political challenge the sect poses, the crackdowns may help resolve the problem of Boko Haram. If not, then crackdowns risk becoming just another element of a cycle of violence.